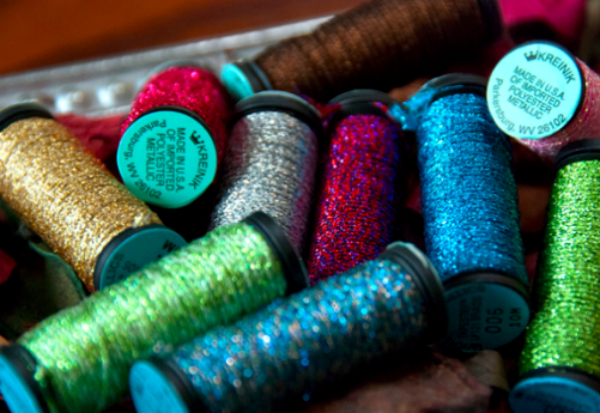 Kreinik 1/16" metallic ribbon is a high quality metallic thread Color numbers with an "F" are glow-in-the-dark colors and will glow when exposed to light; they also look great under black lights. Color numbers followed by "L" are lustrous, those with "HL" are Hi Lustre, those with "V" have a vintage-matte finish, those with a "C" are braided cords (stiffer, resemble real metals), those with "J" are Japan metallics, and those with "L" are holographic. This metallic thread provides perfect coverage on 18 mesh.